Being a Minecraft player can be a little like living on a fault line. Every update represents a seismic shift in one area or another, and a longer wait often means a bigger shake-up once the quake finally hits. 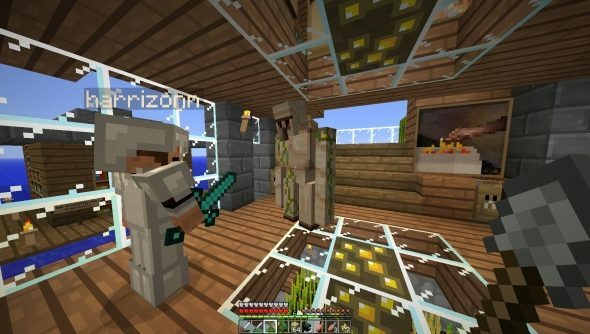 The wait for 1.3 has been the longest in Minecraft’s history, largely because of significant changes made to the game’s engine. “I was a little scared to push it to the public,” says Jens Bergensten. “But waiting even longer is not a solution.” Oo-er. At the quake-fearing user end of things, 1.3’s biggest shift might be LAN support for single player servers. Another significant rumble, though, comes with the addition of villager trading and emeralds for currency. Some new items – namely chainmail and enchantment bottles – will only be available through trading. For better or worse, villagers have changed the fundaments of what Minecraft once was – the dichotomy of man and wilderness – in favour of a better populated world. The option of a “bonus chest” might make the business of starting a new world more palatable after, say, a recent update. Really though, it’s to allow new players circumvent what remains an alienating early game: entirely reliant on the existence of Minecraft Wiki, it still requires that initial logic short-circuit of punching a tree. Another key convenience feature comes in the form of the Ender chest, used to store items, craftable with eight pieces of obsidian and an eye of ender. Its contents will be consistent across all chests, meaning tools left half the world away can be retrieved by simply building another. Enchantment orbs will now be retrievable not only from mobs but from “other tasks”, and – in what one would suspect is not an entirely unrelated point – enchantment level is now capped at 30. New areas come in the form of Desert and Jungle Temples. Without wishing to spoil too much, you’ll want to be careful of another new addition in the latter – tripwires, and the consequences of triggering them. It’s not all sudden death and scattered equipment in the jungle biome, however. Cocoa beans – waiting to be plucked from plants climbing the jungle trees – can be used to make brown wool and cookies. Yum. For the full change log, visit Mojang’s site. Some key features have been pushed back to Minecraft’s 1.4. update, including a modding API for servers.